Hyper CTF is a very fast paced, Chaotic version of Vehicle CTF. 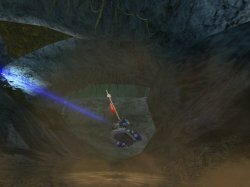 All vehicles are replaced with flag-carrying Hoverboards, and all players spawn with self-recharging rail guns (the Chaos ERDW). In addition, player movement speed is increased, and players spawn with the Chaos Anti-Gravity Belt. 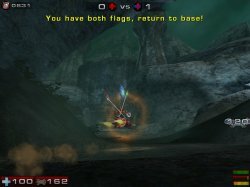 Chaos Hyper CTF uses the same “return your flag” rules as Chaos CTF. This means when your flag is dropped on the ground, you must actually pick it up and carry it back to your base yourself. Hyper CTF works on any VCTF map! When you select the Hyper CTF game type, all vCTF maps you have installed will show up in your map list. Hyper CTF can even be played on non-Chaos maps! 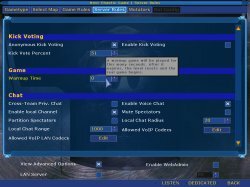 You are free to choose any vCTF maps you have installed, you are not limited to Chaos maps. 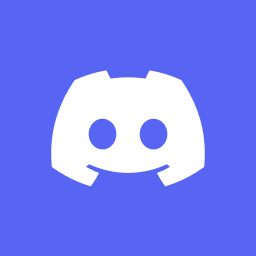 Hyper CTF has bot support! The bots understand the “return your flag” rules of Chaos Hyper CTF, so if you enjoy offline games, they’re ready for you. 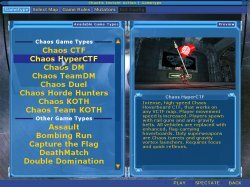 Once Chaos is loaded, and you’ve selected Instant Action from the main menu, you will see the game types menu, and from here you can select Chaos Hyper CTF. Then select a map and proceed as you would for any other game type. If you are starting a Chaos Hyper CTF server, there is a WarmUp setting under the Server Rules tab. If you set a WarmUp period, players will be able to move and even frag each other, but the flags cannot be picked up. Of course any and all points that are gained in warmup are erased when the actual match starts. This warmup period is of course optional, and perhaps is most useful when attempting to set up organized matches. – If a flag is dropped into areas like lava or outer space, it will not be automatically returned to it’s flag base. Instead the Chaos code will attempt to return the flag to as close to where it left the playable area as possible, though it’s not always exact. Remember, always follow the radar dots to find the flags.- You can bind a key in the Chaos menus for ‘Drop Flag’, so that you can toss any flag(s) that you are carrying to a teammate, if needed. See configs page for details on keybinds.